Waiouru: Only hirers cruise in the rain! Well that’s not true. We left Sneyd Junction with the weather rather overcast. 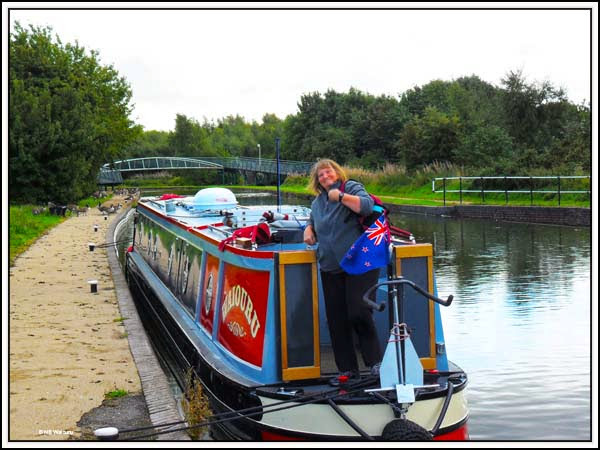 We slowly cruised down to Birchills Junction turning left to stay on the Curly Wyrley and then immediately mooring so Jan could walk the 200 metres down the Walsall Canal to shop at Sainsbury’s. 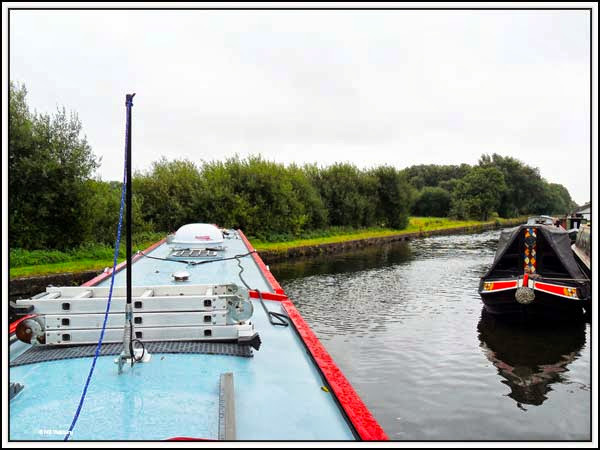 We had been cautioned by both Paul (Waterway Routes) and CRT to keep cruising through the next section during school hours and not consider mooring before reaching the open ground beyond Freeths Bridge. Security wasn’t an issue because it started to drizzle and then rain. Jan disappeared inside as neither of us thought there was any value in both of us standing in the rain. 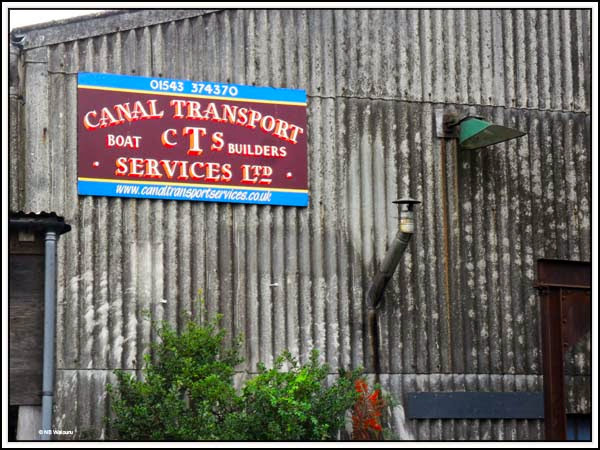 This section of the canal was very similar to yesterday being a mixture of residential and light commercial. There were plenty of urban jellyfish and Birmingham eels (plastic bags and bottles) in the canal. There isn’t much of a flow so it’s probably all local and an indication of the local populations attitude towards the canal and general environment. 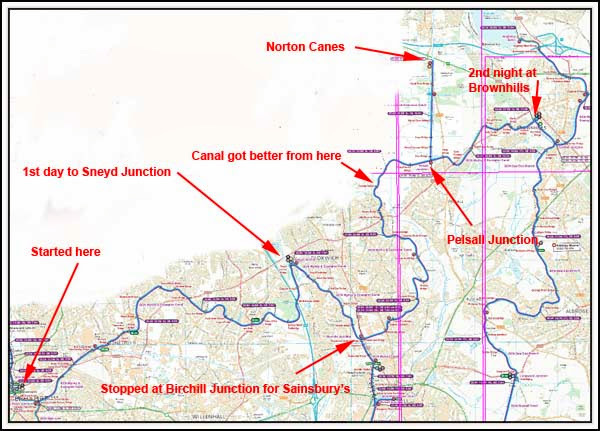 At Freeths Bridge there was a marked change in the condition of the canal associated with a change from residential to rural . 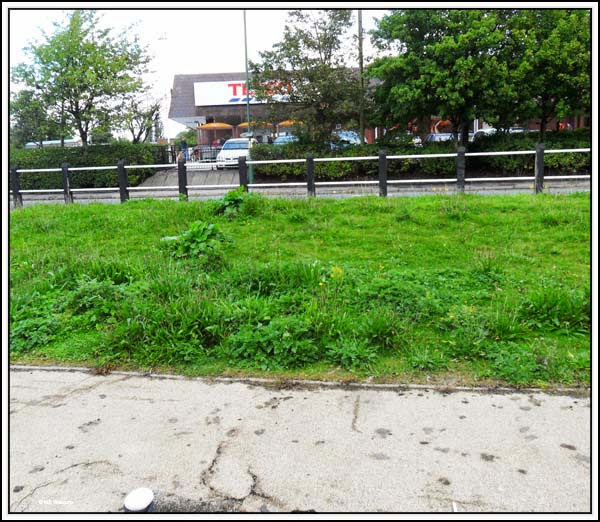 The depth and reeds/weeds didn’t change but the rubbish disappeared which enabled me to increase the speed by another 200rpm. Waiouru loved the conditions and even I started to feel cheerful, despite the seams opening in my cheap shower jacket. Our general feeling is this part of the BCN is slightly similar to the Caldon Canal with it looking rather “grubby” at the beginning but the last half is rather attractive. 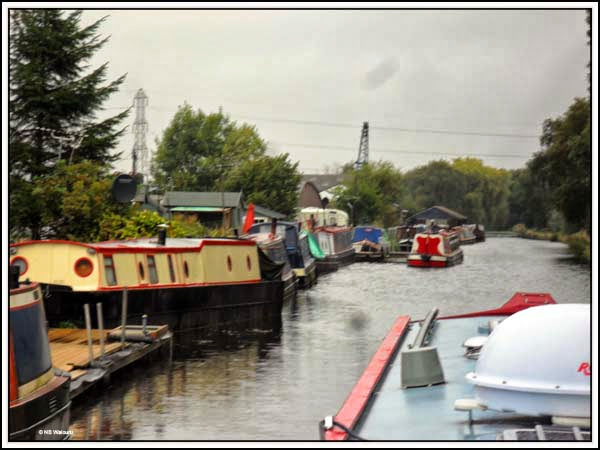 At Pelsall Junction we turned north and took a detour up the Cannock Extension. Paul had mentioned this arm is the straightest on the network and it certainly looked that way. For some reason I’d expected this part of the canal to either be densely populated or full of light industry. It was completely the opposite with nature reserve on either side. Even more surprising was the number of boats moored at the end of the arm. 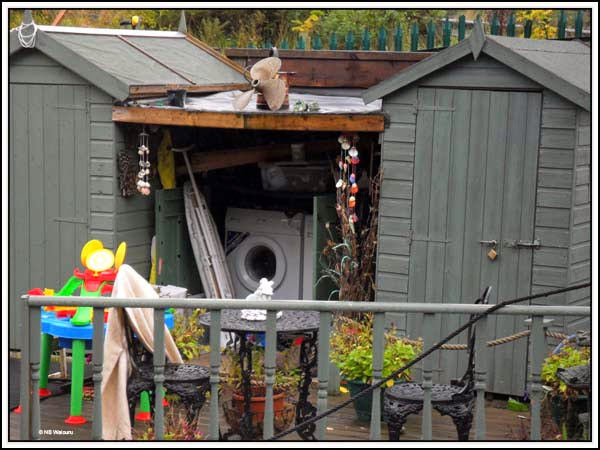 Jan was particularly amused by the first moored boat which had it’s washing machine and dryer in a shelter beside the mooring. 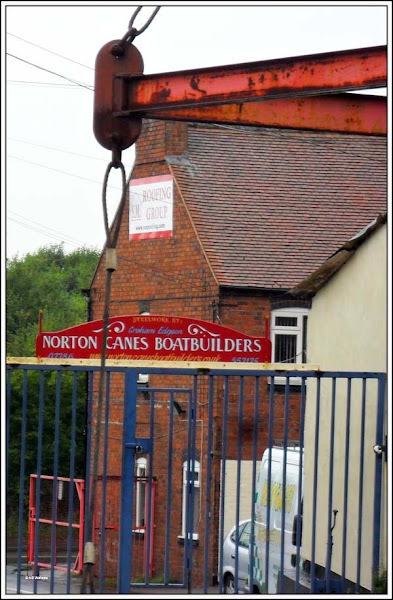 When we started considering living on a narrowboat and cruising the inland waterways I never envisaged we would actually reach Norton Canes on the BCN. And here we are! We obviously had to wind (turn around) and the winding hole is the entrance to the dry dock. The dry dock is located inside the above building and forms the apex of the triangular winding hole. A sign on the wall states the stern should be positioned in the apex in order to wind. Getting Waiouru’s stern against the entrance to the dry dock wasn’t that difficult but the wind against the bow made getting it around more of an issue. OK….. I cheated and used the “girlie button” to assist. Hell, we paid good money for a large and powerful bow thruster so we might as well use it when required. Those two painted shells outside the dry dock looked rather nice! Almost as nice as a Wilson-Tyler shell! With plenty of water under the baseplate and minimal weed we were able to cruise back down to the junction at 1500rpm. 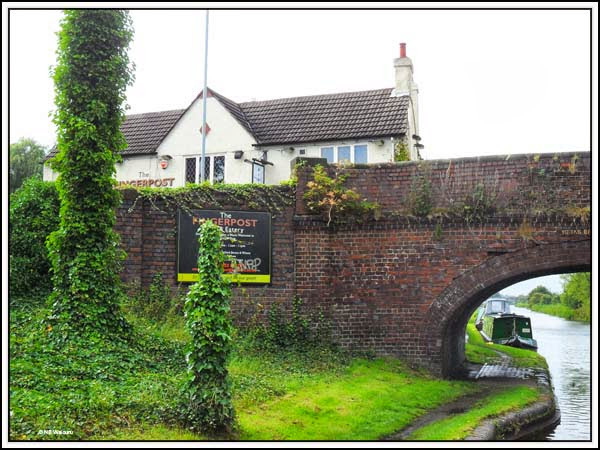 It was a left turn back onto the Curly Wyrley and very soon we reached the Finger Post pub which had four boats moored outside. No room for us! The canal was proving to be a delight and then the rain lifted leaving just a slight drizzle. 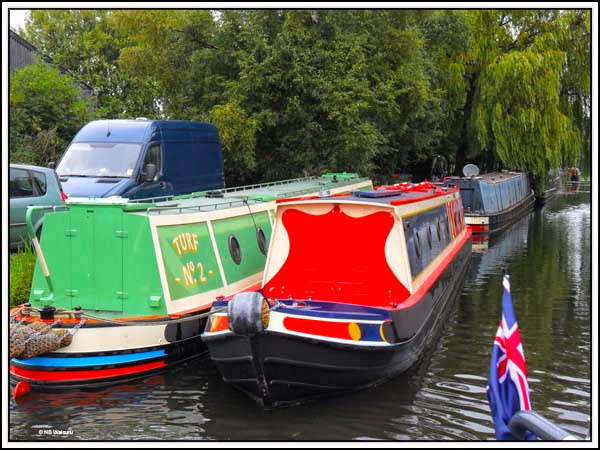 I commented to Jan that we hadn’t seen a moving boat since leaving Horseley Field Junction and the canal was so isolated no hire boat would ever use it. 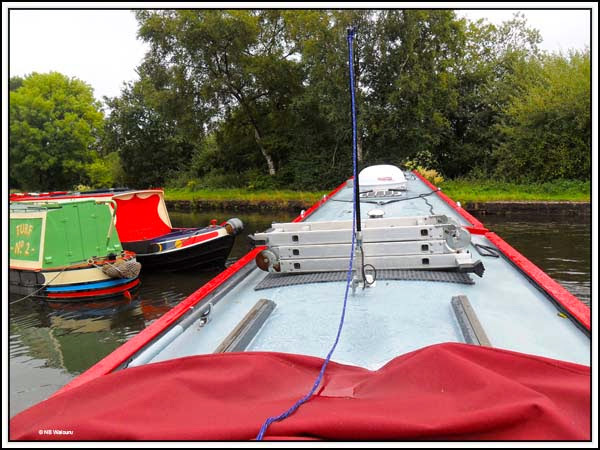 As we exited the next bridge hole a hire boat appeared from the opposite direction followed by a private boat <oops…. spoke too soon>. 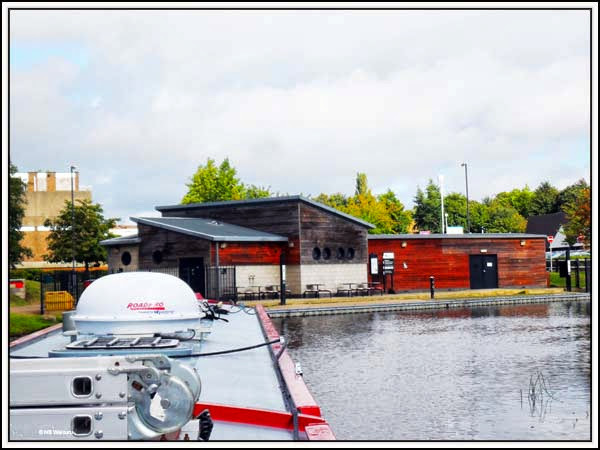 The CRT facilities at Brownhills looks rather swish until you realise they are also used by the local canoe club. There are good moorings with bollards just along from the water point. No time restriction. It seemed a good place to finish our second day on the BCN. What’s particularly good about these moorings is the building opposite. A 24 hour Tesco supermarket. Just to the left is an Aldi and Wilkinson. If all of this was on a more popular part of the network the moorings would have a time restriction. So where have we cruised over the last two days. I would have to say we were a little concerned when we started but once we reached Pelsall Common the canal turned into a delight. I was expecting it to all be either industrial or residential and to find rural countryside has been a revelation. Why was the canal constructed? Initially I assumed it must have been built as a ‘feeder’ for Chasewater Reservoir. Then I realised this would only require a narrow ditch. Passing under a bridge I noticed a sign Horseley Iron & Coal Company 1824. This led me to assume the area was mined for coal and iron ore. After looking at Wikipedia I now understand the canal was built to transport coal from mines in the area.